Pics of Ops Inc M4-S inside. 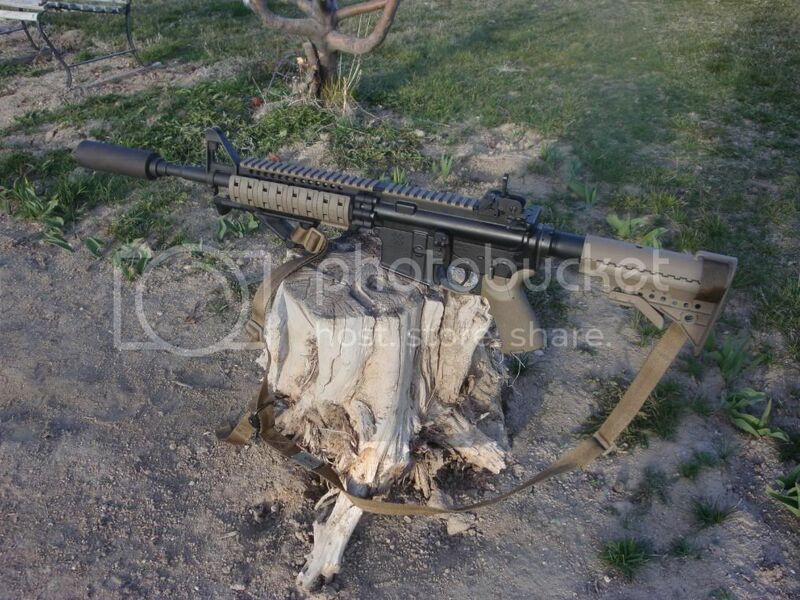 Post subject: Pics of Ops Inc M4-S inside. I'll have a range report this weekend. Here is your last pic free of the "FBI black box" style of censorship. Range report is all good! I was honestly surprised at the reduction level when using the human ear, I guess you could say. I did not expect to get the results I did. Not much info about these little guys around the interwebs. All you really get are discussions about the M4S not being, or marketed to the civilian world. So I guess I didn't expect much from it and that may have been the reason I was so shocked with it's performance. I fired it without any hearing protection just to see...only a very slight ring after a mag dump. Nothing like it would have been had I not had it on the gun. It gives all those little perks you get from full size cans like recoil reduction and accuracy improvement for example. POA/POI shift is very minimal. Thats about it...I love this little can! 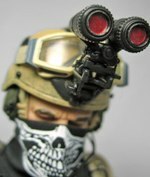 Your Ops Inc shorty is pretty cool! What SOT did you buy from and what was your total cost can and muzzle brake / collar - ball-park? I bought from ADCO. They are the only dealer that carry the M4S. There have only been 24 or so made from the info I have gathered. I bought from the first batch, ADCO now has the second batch. The can was just over $200 shipped to my dealer. The hider and collar were inexpensive for me, I have a friend that always has a ton of em. I think the collar was $5 and the hider was $30. Nat a bad price on the can huh? Another reason I didn't expect much, but really feel like I got more than I paid for. 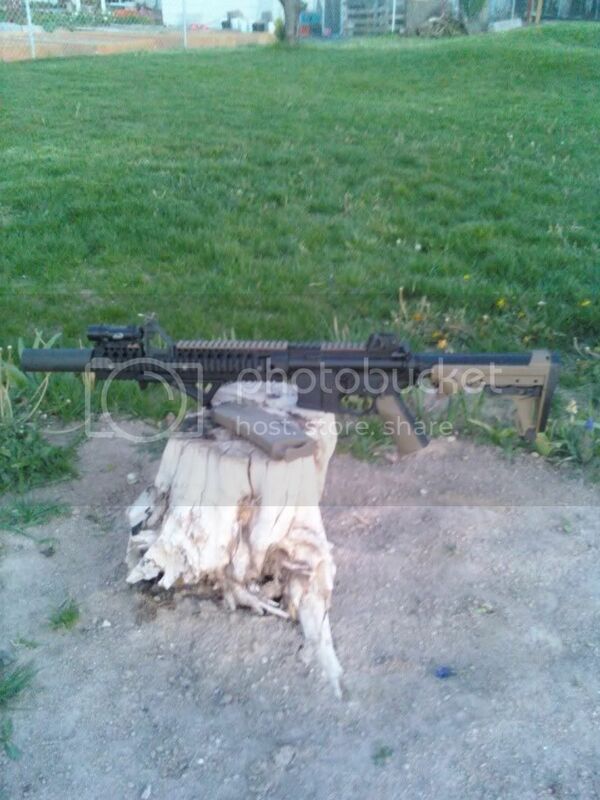 Post subject: Re: Pics of Ops Inc M4-S inside. Hmm... that thing is pretty slick. It's just so cute! If I had a need for a stubby can, that would be the one. You're gonna love it. It's a real conversation piece. I have it sitting on the counter at work, everyone that sees it thinks it's the coolest thing...then I pull it off and show them the mounting platform and how little it adds to OAL. Jaw drops em every time. It's still my favorite can yet. I'm headed your way in a few weeks! I'll call ya first, but I'm showing up if you answer or not....don't shoot me. What is the mounting hardware for these cans? I also seem to have read that bbl work needs to be done to get these to mount? The cans use a 2 piece mounting system. One is a collar that slides onto the barrel and rests against a step (if you look at an M4 profile barrel you will notice the step in the barrel behind the flash hider) and the second is the muzzle brake (or flash hider model). 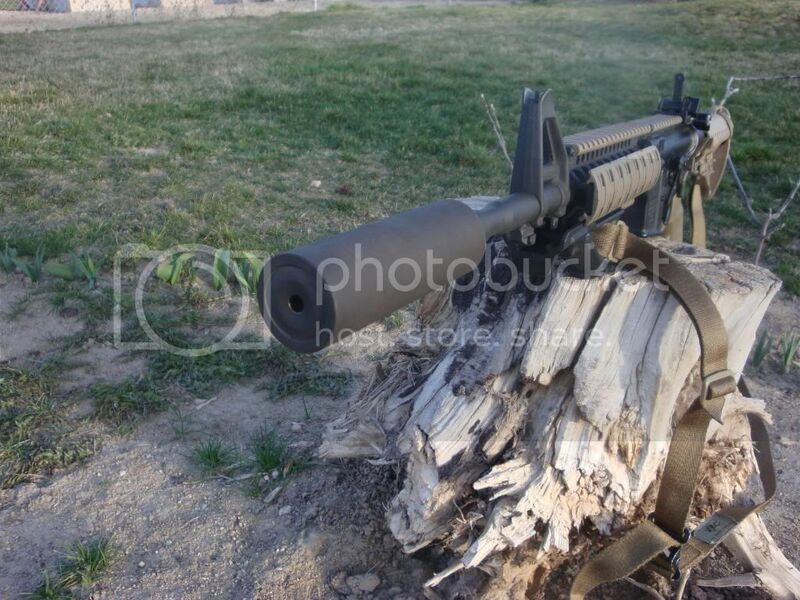 Here is a picture of my M4 setup. If your barrel doesn't have that step you either need to machine that or I believe you could just purchase the Ops adapter that is sold by ADCO Firearms. You would attach the adapter to the end of the barrel and the muzzle brake to the adapter. Here is a crappy pic of my LMT MRP 10.5" barrel with the Ops adapter and muzzle brake. Ok, so if you have the step all you would need is the break/collar set? I'm looking at adco and seeing that kit for $180. Correct. The M4-S is a nice little can. I was very surprised how much of the bark it took away. 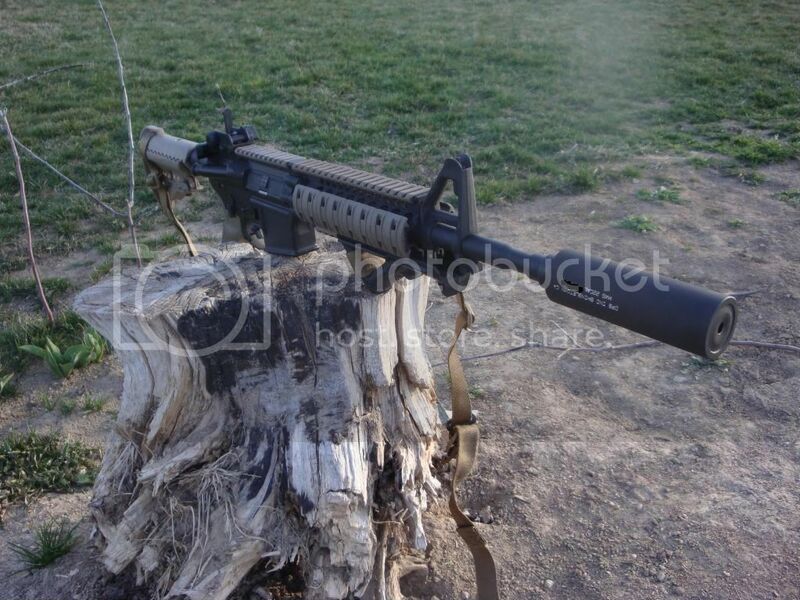 Here is my LMT MRP 10.5" w/without the M4-S. However that wouldn't be for a while. I have other projects ahead of me. Not made of money, unfortunately. Any way we can see the pics again? I've made a few of these since this thread started. Takes a lot of bark off of a short barreled rifle, but it's no where near as quiet as a longer suppressor with a baffle stack. Still, they are simpler(cheaper) to make.